A quint may have up to eight surrounding quints. Thus the central cell in the above image (containing a red dot) has 5 cells that share a side and 5 cells that share a point. 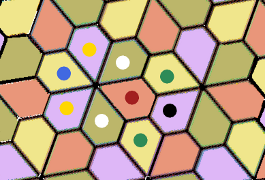 Two of these (containing a white dot) are joined by both point and side.